In a bid to pressure India to invest in a Persian Gulf gas field, Iran has put ONGC- discovered Farzad-B gas field on a list of fields it plans to auction citing delays by the Indian firm in its development. ONGC Videsh Ltd, the overseas arm of state-owned Oil and Natural Gas Corp, had in 2008 discovered the Farzad-B gas field in its Farsi exploration block in the Persian Gulf. In August/September, 2010, it submitted a revised Master Development Plan (MDP) for producing 60 per cent of the 21.68 trillion cubic feet of in-place gas reserves but had not signed the contract because of threat of being sanctioned by the US which is against any company investing more than $ 20 million in Iran's energy sector in any 12-month period. For more than two years, it did not carry out the threat of cancelling allocation of the Farsi block to OVL. Tehran has now put the field on the list of blocks it wants to auction in future, sources with direct knowledge of the development said. It has however not yet cancelled OVL's exploration license for the Farsi block which gives it the right to develop the discoveries it has made. Sources said inclusion of the block in the list of areas Iran wants to auction is an attempt to pressurise New Delhi into investing in the project. In the past, Iran has threatened to cancel award of Farsi block to OVL over delays in signing of the Farzad-B gas field development contract. But Iran has not carried out those threat because it knows it cannot get any credible international oil company to invest until the western sanctions are eased. While OVL cannot invest in developing in the gas field because of the US sanctions, it plans to Iran engaged and will make investments once sanctions are eased, they said. OVL is the operator of the Farsi block that lies north of Qatar. It has 40 per cent interest in the 3,500 sq km block. State refiner Indian Oil Corp (IOC) too has 40 per cent stake, while the remaining 20 per cent is with Oil India Ltd (OIL). The Farzad-B gas field may hold an estimated 21.68 Tcf of inplace reserves, of which 12.8 Tcf can be recovered. 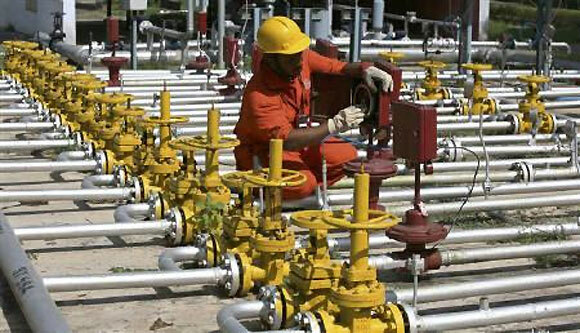 The reserves in Farzad-B are almost thrice the largest gas field in India. The Indian consortia would get a fixed rate of return on the $ 5 billion it will invest on developing the Farzad-B gas field as Iranian law prohibits foreigners owning oil and gas resources. Foreign companies develop the fields through service contracts. OVL, which had originally submitted a master development plan for the Farzad-B field in April 2009, can buy Iranian gas from the remuneration it will receive under the service contract. After the Iranians raised certain queries, OVL submitted a revised MDP in August/September, 2010, proposing to invest over $ 5 billion over a 7-8 year period. OVL in 2006 made an oil discovery in the Farsi block, which was initially thought to contain one billion barrels of reserves, but was later found to not have enough reserves for commercial exploitation. Farzad-B field was declared commercial in 2008 after drilling several wells in the Farsi block which was awarded to OVL in 2002. The Indian consortium wants to liquefy the gas found in the block and ship it back home in the form of liquefied natural gas (LNG). The consortium of OVL, IOC and OIL has a service contract for the Farsi block, under which the JV partners will be reimbursed for the entire $ 90 million investment they made during the exploration phase in the block, as well as an additional 35 per cent. If the consortium gets the developmental rights, they will be paid a 15 per cent rate of return over-and-above the investment they make. OVL had previously stated that as per independent studies by Fugro Robertson Ltd of the UK and ONGC's Institute of Reservoir Studies, the in-place gas reserves of the block amounted to 9.48 Tcf in a worst case scenario, whereas in the best case, they could add up to 21.68 Tcf. Under Iranian rules, the project promoters are not allowed to take oil or gas out of the country. As such, the OVL-led consortium had to bear the risk of all exploratory operations and was only guaranteed reimbursement after establishment of commercial viability.